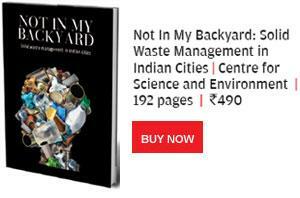 Urban India faces an enormous challenge: managing its gigantic load of solid waste. It is not just a public health issue, but also turning out to be a serious law and order problem as people resort to violent methods to protest waste being dumped in their backyard. But cities simply do not have the space or the wherewithal to dispose of waste. The challenge is going to be tougher. With India's urban population growing at 3-3.5 per cent annually, the waste generated by cities is expected to increase by 5 per cent every year. How are our cities managing this challenge? A survey by Delhi-based non-profit Centre for Science and Environment (CSE) attempts to find this out. In a unique method, CSE first solicited nominations from people and environmentalists on cities they think are managing their wastes well. Once the list of nominations was ready, researchers visited these cities to comprehensively analyse their waste management practices. The criterion of terming a city clean has not been a superficial assessment of the city's look and feel but the sustainability of its ways to manage waste. In the final report, it comes out clearly that there are examples worth emulating to make cities clean in a sustainable way. There are also examples that show how not to manage waste. The survey divides the cities analysed into three categories: those that collect, segregate and process waste, indicating a holistic way to process waste (rank 1 to 4); those that collect, but only have partial segregation and treatment facilities (rank 5 to 8); and those that collect but do not segregate or process waste (rank 9 to 14). Alappuzha, Panaji, Mysuru and Bobbili, as the survey says, are India's top four clean cities because they give priority to segregation of waste at the household level, and its reuse. 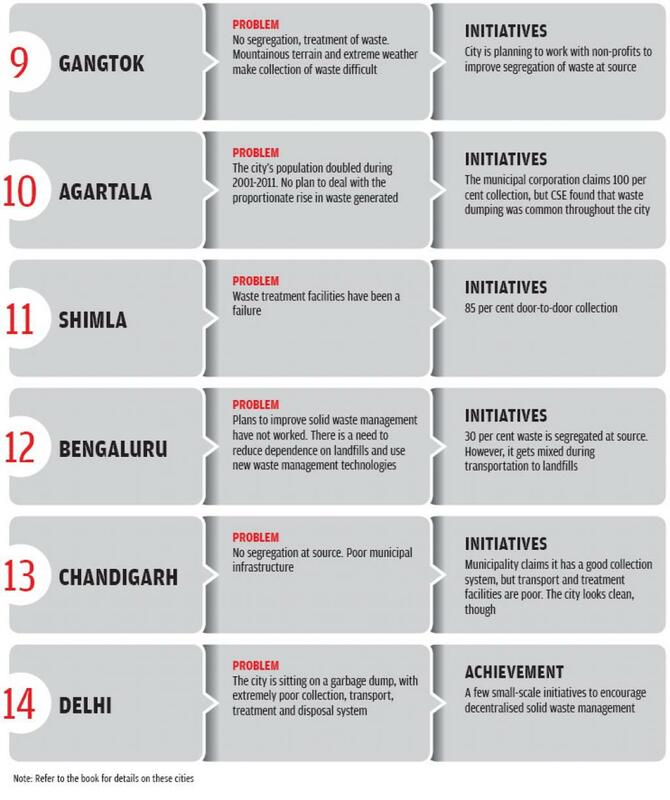 Down To Earth profiles India's cities that have won the challenge of managing waste and highlights the lessons the country should learn from their experience. In July 2012, Alappuzha was facing a crisis. Known as the Venice of the East for its large network of canals, backwaters, lagoons and beaches, the city looked like a waste dump. Rotten garbage had piled up on roadsides, and canals and drains were clogged with bags of stinking waste. Swarms of mosquitoes and flies had invaded the city, spreading chikungunya and dengue. Alappuzha, which has a population of 0.174 million and produces 58 tonnes of solid waste a day, is implementing a project called Nirmala Bhavanam Nirmala Nagaram (Clean Homes Clean City) since November 2012. The focus of the initiative is segregation and treatment of wet waste at the source. “About 75 per cent of the waste is biodegradable, and one-third of this comes from households,” points out Thomas Isaac, member of the Kerala Legislative Assembly from Alappuzha, who leads the initiative. What led to this shift? 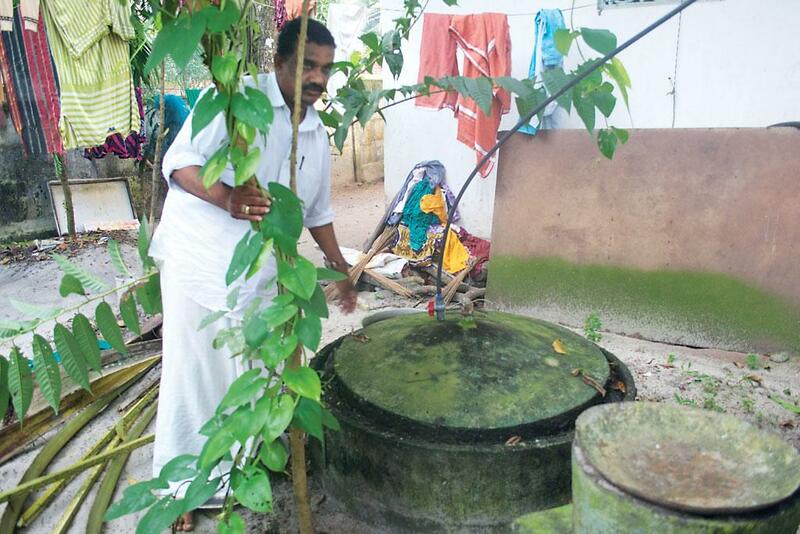 It was an acute crisis that forced Alappuzha to try a different method of waste management. The municipality had been dumping waste for decades in a six-hectare plot it owns in Sarvodayapuram, a village in the nearby Mararikkulam village panchayat. This had caused environmental pollution, contamination of water sources, stench, mosquitos and flies and spreading of diseases in the neighbourhood of the plant, says P V Sathyanesan, president of the village panchayat. 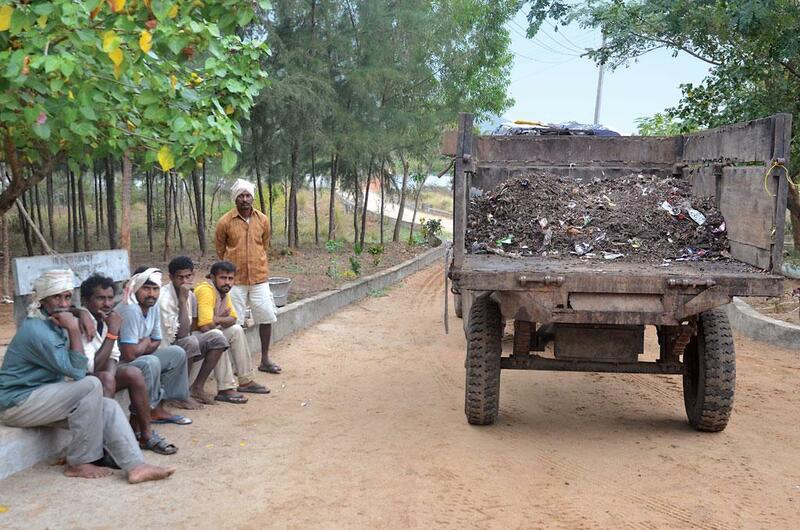 In June 2012, the residents of Sarvodayapuram rose up in arms against waste dumping in their backyard. There were protests, hunger strikes and blockade of the road leading to the plant to prevent the municipality’s trucks from entering. The protests lasted for 100 days. After many rounds of discussion, the village panchayat allowed the municipality to bring in just four–five tonnes of waste per day. In November 2014, the panchayat disallowed even this. The strict stance of the rural local body pushed the city into a corner. For some days, the municipality buried its waste, but public places for burying waste were exhausted very quickly. When garbage started spreading everywhere in the city, Isaac decided to try decentralised waste management. Under his leadership, many rounds of discussion were held among the municipality authorities, councillors, resident associations and leaders of all political parties. A preliminary survey was conducted by women’s self-help groups to find out how citizens disposed of the waste they generated and what were their requirements. Organisations such as Kerala Sastra Sahitya Parishad, a people’s science movement which runs a reputed research institute on rural technology, the Integrated Rural Technology Centre (IRTC) in Palakkad district, and Kerala government’s Agency for Non-Conventional Energy and Rural Technology were roped in the discussions. The outcome of all these efforts was the decision to go for decentralised waste management. The Alappuzha municipality has about 40,000 households in its 52 wards. The Clean Home Clean City programme was started in 12 of the most urbanised wards, covering 12,000 households, as a pilot project. The plan was to make the maximum number of households set up portable or fixed biogas plants. Those who did not have enough land were advised to go for pipe composting. The fixed biogas plant costs Rs 17,500 and can treat 8-10 kg of waste per day. The plant provides biogas for two–three hours daily. The portable biogas plant has a capacity of 1,000 litres and costs Rs 13,500. In this plant, 5–7.5 kg waste can be converted into compost and the biogas is available for 80-90 minutes. Suchitwa Mission, the state’s nodal agency in-charge of the total sanitation programme, gives 75 per cent subsidy to biogas plants and the cost to the user is around Rs 5,000. The pipe composting system is ideal for a small family. It consists of two PVC pipes of 1.25 m length and 20 cm diameter with two caps. The pipes are fixed in a vertical position on the ground with one-fourth of the pipe under the ground. A 30 cm thick layer of gravel is first put into the pipe to absorb leachate. Waste can be put into one pipe for 30-35 days till it is full. Once full, the first pipe is closed with the lid. Then for the next 30-35 days waste is put in the second pipe. By the time the second pipe is full, waste in the first one would be converted into compost. The cost of this system is just Rs 890, and the state government provides 90 percent subsidy for this. The user can get it installed for just Rs 100. In 2013, the clean city drive took a new turn with the entry of Thumburmuzhi, a model aerobic composting unit named after the Thumburmuzhi campus of Kerala Veterinary and Animal Science University where it was developed to compost carcasses of animals. The model consists of a tank of 4x4x4 feet (1 feet equals 0.3 m) made of ferro cement or bricks. It is designed in such a way that air enters into the tank through the gaps on the sides. It should be kept under a roof to avoid rainwater falling into the tank. About two tonnes of waste can be processed into compost in 90 days in this tank. A layer of fresh cow dung or slurry from the biogas plants is put at the bottom of the tank to generate microbes for composting. Above this, a 15 cm layer of dry leaves or dry grass or small pieces of paper is placed. Over this, layers of bio-waste and cow dung are placed. Dry leaves and dry grass absorb water oozing from the garbage. The construction cost of each tank is around Rs 10,000. A unit with two tanks, roof, side walls and water facilities costs Rs 1–1.5 lakh. The municipality has set up 12 waste collection centres, with 165 Thumburmuzhi bins at public places and the old waste dumping spots. These are maintained by 168 contingent workers of the municipality who used to collect waste from dump spots in the city and transport it to Sarvodayapuram. 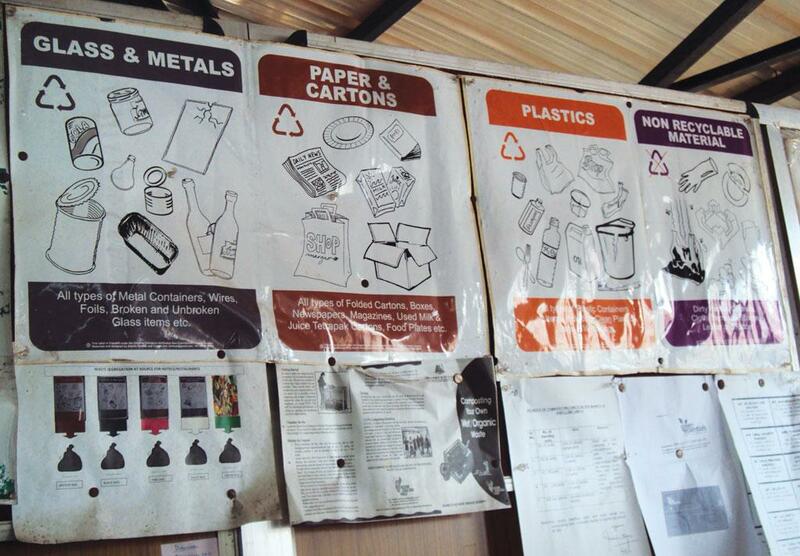 The households which do not have other waste processing facilities can bring their waste to the aerobic bins. Collection time is fixed at 6-12 in the morning and 6-10 in the evening. The municipality has also formed night squads of sanitation workers. If any resident is caught throwing waste, a fine of Rs 2,500 is imposed. If waste is dumped into a canal or a waterbody, the fine may go up to Rs 20,000. As of now, 12 wards have been declared Total Sanitation Wards, with 80 per cent households having simple composting/biogas techniques and establishments with good sanitation facilities. The municipality has plans to turn another 11 wards into Total Sanitation Wards. The plan is to set up 4,200 (1 m3 size) portable biogas plants, 500 fixed plants, 13,033 pipe composts and 200 aerobic composting bins. All of these together can treat 31.9 tonnes of garbage. “We do not make tall claims,” says Isaac. “There is still a long way to go. Our biggest achievement so far is that all residents, shops, offices and hotels have started segregating waste,” he adds. Waste management in Panaji, the capital of Goa, is carried out at three levels: collection and segregation, transportation and intermediate storage, and treatment and processing. The City Corporation of Panaji (CCP) manages the solid waste in the city. Of the 55 MT of municipal solid waste (MSW) generated by Panaji every day, 20 MT is wet waste. Till the early 1990s, the town’s MSW management was characterised by a weak system with poor infrastructure, resulting in unhygienic civic conditions. In 1995, with the assistance of the Central government, the United Nations Development Program (UNDP), and the Water and Sanitation Program-South Asia (WSP-SA), CCP undertook its Solid Waste and Resource Management (SWARM) project. But despite planning and infrastructure upgradation, sanitary conditions remained unsatisfactory. In early 2003, a comprehensive city revitalisation campaign was launched, with MSW management as one of its critical components. Panaji was christened a bin-free city. The bin-free system was complemented by a door-to-door collection (DTDC) scheme which was rolled out in the entire city. CCP has a separate cell for managing MSW, headed by a municipal engineer who supervises the waste management in the entire city. The 115 residential colonies of Panaji are divided into 12 waste management zones, each under a supervisor who manages the collection and transportation for the zone. The same workers carry out the street sweeping and door-to-door collection. CCP charges Rs 365 per year as sanitary fee from every household for SWM; this fee is linked to the property tax. Hotels are charged Rs 300-10,000, depending on the quantum of waste generated. MSW is collected door-to-door by SWM workers using trolley bins. The generators segregate their waste. CCP has introduced a five-way waste segregation system for households and hotels, and a two-way segregation system for commercial establishments. Under the five-way segregation system, the components to be segregated by households and hotels are wet waste, plastics, paper and cartons, glass and metals, and non-recyclable material. CCP has five compactors for collecting organic waste, and tippers, dome-shaped trucks and rickshaws for transporting dry waste to the sorting centres. The waste is transported to Panaji’s 12 sorting centres (one in each zone) to segregate them into sub-waste streams. For instance plastic waste is segregated further into carry bags , cartons, etc. Wet waste is composted at decentralised compost pits in the colonies. There are around 70 composting units in the city. Dry waste is brought to sorting centres, where it is sorted with the help of a moving belt. The non-recyclable and the soiled recyclable wastes are compressed into small bales and delivered to cement plants in Karnataka. The municipality is still struggling with horticulture waste, which is substantial in this tropical and coastal city. This waste is being temporarily deposited in a ground, but CCP is working on ways to shred and compost it. rulers of Mysore, now Mysuru, built the city in a way that it remains one of the most liveable cities in the country even today. The city generates around 400 tonnes of total solid waste a day, of which 60 per cent is wet waste and the rest is dry waste. 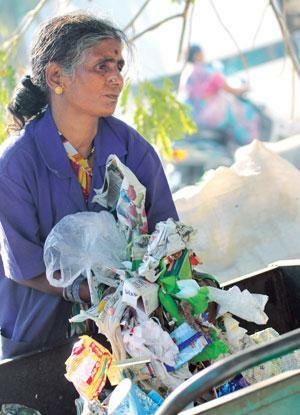 In terms of solid waste management, the Mysore City Corporation (MCC) has focused on reduction and segregation of waste at source; door-to-door collection, recycling and reuse of waste, generation of wealth from waste; and involvement of public, non-profits and educational institutions in public awareness campaigns. Campaigning activities like daily morning FM radio jingles, pamphlets and door-to-door contact programmes, are also undertaken. According to Ramachandra, public health officer, MCC, 36 of the city’s 65 wards have started segregation of waste at source. As of March 2016, the municipality reported some 30 per cent segregation of waste in the city. The door-to-door collection in the city is about 95 per cent. The 65 wards are divided into nine zero-waste management units (ZWM) of which eight are functional and one is yet to begin operation. According to N Raju, additional municipal commissioner, each ZWM unit has been allotted to an environmental engineer who has targets to achieve the maximum possible segregation at the ZWM. The door-to-door collection starts in the morning at 6.30. Handling of 62 of the wards has been outsourced to 620 labourers. Three wards are handled by 30 workers of Mysore City Wards Parliament, a municipal body. The collection process deploys 168 auto tippers and 396 pushcarts. Slaughter house waste is collected separately by five auto tippers and one canter. Fifty-five tipper lorries are used for transportation of street sweeping waste and silt. The auto tippers bring the segregated waste to the respective ZWM unit, where the it undergoes secondary manual segregation. The unsegregated waste from the rest of the wards goes directly or through secondary collection to the compost plant at Vidyaranyapuram. Each of the nine ZWM units covers five to 10 wards. Each unit has a small composting unit and a resource recovery unit. The biodegradable waste is subjected to composting and within a period of 30-45 days it is converted into manure. The dry waste is handled by manual segregation and saleable material is sold to local recyclers. Inert materials (such as dirt, ash) are sent to the landfill at Vidyaranyapuram, which has been built by MCC and Jamshedpur Utilities Supply Company under the Jawaharlal Nehru National Urban Renewal Mission on build-operate-transfer basis. The 200-tonne capacity compost plant located near Vidyaranyapuram was established in 2001 under the Asian Development Bank. The plant’s operation and maintenance has been outsourced to IL&FS, a private company. It pays a lease rent and royalty of Rs 6 lakh/annum to MCC. According to Chandra Shekhara, plant operation manager, 150 metric tonnes of unsegregated (mixed) waste is received daily through door-to-door collection, of which 90 MT goes to the landfill and around 30 MT gets converted into compost. The compost is sold to fertiliser companies at Rs 3,200 per tonne. To reduce the smell, a barricade of about 8 m has been erected around the compost plant. In 2008, Bobbili was as dirty as any other Indian city. Waste littered the streets of the town, garbage heaps were not cleared regularly and as a result the drains were frequently blocked, especially with polythene bags. Moreover, there were very few waste-transport vehicles. The problem kept aggravating until 2009, when K Prasad assumed office as the town’s new municipal commissioner. In 2008, Prasad started mobilising people for a cleaner town. He conducted regular awareness programmes for public that helped build an understanding for segregating wet and dry waste at every household and completely stopped incidences of careless littering. In April 2011, the municipality passed a resolution to ban the use of polythene bags. The municipality began door-to-door collection of waste from June 6, 2011. By the end of 2011, a significant population had started practising waste segregation at source. In early 2015, the municipality’s sanitation workforce had 14 permanent workers and 57 contractual labourers for cleaning the streets, drains and collecting waste door-to-door. The entire municipal area, with 30 wards, is divided into nine routes to be taken care of by different groups of sanitation workers and vehicles. The routes are decided on the basis of population density. The collected waste is taken to the lone transfer station where the segregated waste is sent to the Solid Waste Management (SWM) Park. The 3.4 ha park, started in June 2011, receives waste for treatment and disposal. Of the 14 MT of waste generated and collected in the town per day, around 3.6 MT is processed. The Bobbili municipality is also using livestock as a part of the solution. The park rears a few pigs which are fed the food-waste received from hotels. Similarly, chickens take care of little insects in the waste heaps and ducks eat the fish-food waste. The rest is dumped without any processing. The municipality does not charge waste collection fee from residents, but charges an annual fee from the 1,072 commercial establishments. This comes to around Rs 3.6 lakh per year. The municipality earns another Rs 7.26 lakh annually by selling recyclables like plastic bottles, paper glass bottles, and bio-compost. Waste management costs the municipality about Rs 77.61 lakh. It earns about Rs 2.6 crore annually from property tax, of which 30 per cent is spent on waste management. Shankara Rao, the commissioner of Bobbili, plans to revive the dying practice of waste segregation at source. He also wants to construct an engineered landfill site because, currently, the leftover waste is being dumped unscientifically. Interestingly, the municipality plans to adopt a village—it will take fresh cow-dung and kitchen-waste from the village residents and give them bio-gas as cooking fuel and compost in return. Bobbili deserves accolades for the 100 per cent collection of waste—a rare feat. Sanitation Point is one common sign on the steep and narrow slopes of Aizawl. These are the places where residents bring their waste and hand it over to sanitation workers every morning. Garbage collection vehicles negotiate the sharp turns each day to reach these sanitation points. Lalzuiliana, driver of a waste tipper, adeptly parks his vehicle at the sanitation point of Ward No 9. The chairperson of the ward, H S Lalthanliana along with other members of the elected local council, monitors the collection of waste. “It is the people’s power that keeps this city sparkling clean,” Lalzuiliana says. The city’s solid waste management is handled by 82 elected local councils in 19 wards. Local council members, along with the Aizawl Municipal Corporation (AMC), prepare rough estimate of the waste generated in the locality. They jointly decide numbers of trucks required for collection of the waste. The onus lies on residents to inform the council in case they are generating more waste than usual—for instance, in the case of a wedding or a construction/demolition work. “Accordingly, we work out a plan to hire a small vehicle or try to arrange a bigger truck for the next day to clear the waste,” Lalzuiliana says. In 2010, when AMC was constituted, it decided, in consultation with local bodies, on daily collection of waste. “It was decided that 90 per cent of the labour and transportation cost of waste collected from households would be borne by AMC and the remaining 10 per cent would be collected by local councils from households. Later, this government-to-public cost ratio was revised to 80:20,” says Vanlalsawma, executive officer of AMC. Around Rs 27 lakh is spent annually on waste collection from households, from a population of 0.29 million living in the urban areas. It includes a contribution of Rs 21 lakh from AMC. 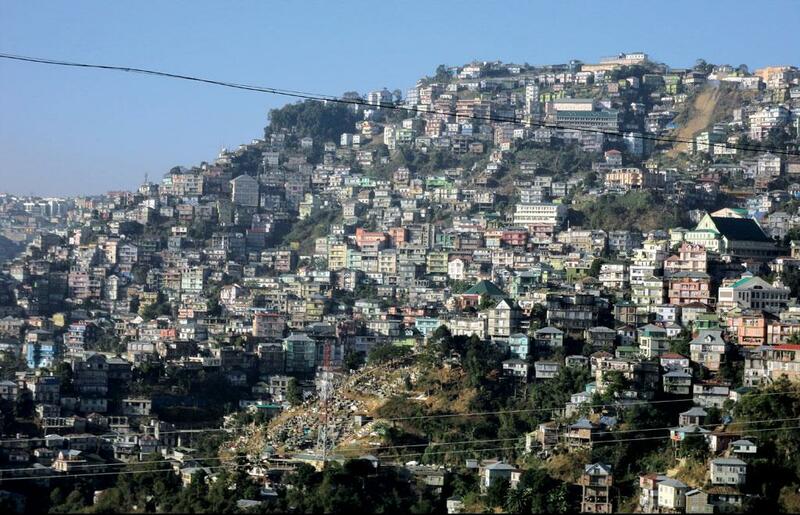 According to the Council’s estimates, Aizawl generates around 165 MT of waste daily. This includes 62.7 MT of biodegradable, 64.35 MT of recyclable and 37.95 MT of non-biodegradable waste. Around 15 medium-capacity trucks and 14 low-capacity vehicles make 2,200 trips per month for waste collection from households. Vanlalsawma accepts there is no concrete plan in place to treat the 165 MT of solid waste generated by the city. “We collect the waste and dump it at Tuirial, a dumping site 18 km from the city, where ragpickers segregate the waste and sell it,” he says. The Tuirial waste dumping site is a horrifying sight. The entire dumpyard is put on fire to reduce the amount of dumped waste. Amidst the bellowing smoke, fire and unbearable stench, 28-year-old Luna is pulling out small and large pieces of iron, even shaving blades using magnets tied to a stick. “I collect only iron scrap and sell it directly to the main scrap dealer. It earns me around Rs 300-500 a day,” he says. Vanlalsawma points out that AMC is streamlining the entire solid waste management plan. “A detailed plan has been prepared for scientific disposal of waste. It is awaiting sanction from the state government,” he says. “We are planning to segregate the waste at the household level. There is plan for a landfill whose life will be around 30 years,” he adds. But clearly this is not a long-term solution. The 600-square-metre compound that shares its boundary with the Pune Municipal Corporation (PMC) ward office in Aundh, an affluent suburb, gives no sign of what happens inside. Strollers cheerfully walk past it. Behind its green steel gates is the city’s cleanest weapon to fight garbage. The five-tonne-per-day (TPD) biogas plant silently operates all day decomposing organic waste—vegetables, fruit rejects and stale food—and converting it into methane. The gas is injected into a generator to produce electricity. The leftover is excellent organic manure. Yet, passersby have nothing to complain. There is no stench around; no flies or eagles hovering above. The plant is Pune’s experiment to ensure that no waste goes to the city’s landfills. “The aim is to make the 244 sq km municipal area zero-landfill by 2015,” Sanjay Gawade, former additional commissioner, municipal solid waste, PMC, had said in March 2014. Besides biogas plants, the city boasts centralised and decentralised composting and vermicomposting facilities, a waste recycling plant using refuse-derived fuel (RDF), and a waste-to-electricity plant using thermal gassification technology. Pune generates 1,400 to 1,600 tonnes of municipal solid waste (MSW) every day, of which about 70 per cent is wet waste. The city’s current capacity to process waste is about 2,100 tonnes per day. In 2009, PMC decided that localised energy generation was a good way to mitigate part of its waste. The first municipal biogas plant was set up in Model Colony, a locality of 4,000-odd residences. The residue from biomethanation, compost, is used in PMC’s gardens. Pune now has 20 commissioned biogas plants. The number will reach 27 by year-end, says Gawade. The plants are set up on the public-private partnership model. Also, over 12 per cent of the 80,000-odd commercial and residential buildings have started composting their wet waste because PMC provides property tax rebates to such buildings under its Eco-Housing Scheme. Pune’s strategy to handle MSW is not without problems. In June 2013, PMC stopped dumping its waste in landfills and started processing unsegregated waste at a 1,000-TPD facility set up by Hanjer Biotech Energies Limited in an adjacent 9 ha plot. When the plant works, the city is garbage-free. When it does not, the municipality becomes a dumpyard. Over the last year-and-a-half, the plant has been operating below capacity, processing only 600 TPD waste, even though it receives 1,000-1,200 tonnes a day. The plant is also struggling financially because it has not been able to sell its products. Till February 2013, it had an outstanding electricity bill of Rs 80 lakh. It had also not paid 250 labourers. PMC may not have faced the problem had there been another efficient MSW plant. Though in 2012, the city had set up an MSW treatment plant at Ram Thekde, the project is struggling. The Maharashtra Electricity Development Agency is yet to give approval to provide electricity to the plant that is handling only 250 TPD waste a day and generates enough electricity to keep the plant running. Rapid urbanisation during the 1990s in Surat, the economic capital of Gujarat, led to an explosive growth of slums and waste in the city. In 1994, the city was hit by plague that killed 52 people and triggered a mass exodus. In just 18 months after the outbreak, Surat transformed into one of the cleanest cities in the country. Today, the city’s municipal solid waste is being managed by the Surat Municipal Corporation (SMC). E H Pathan, executive engineer and in-charge of solid waste management, SMC, says, “A host of institutional changes was adopted to manage waste. The city was divided into seven zones to decentralise responsibilities for all civic functions.” The entire city was covered under the collection system by November 2004. SMC also reached out to municipalities and villages around Surat city and today, about one million residential complexes and 0.22 million commercial complexes are covered under it. 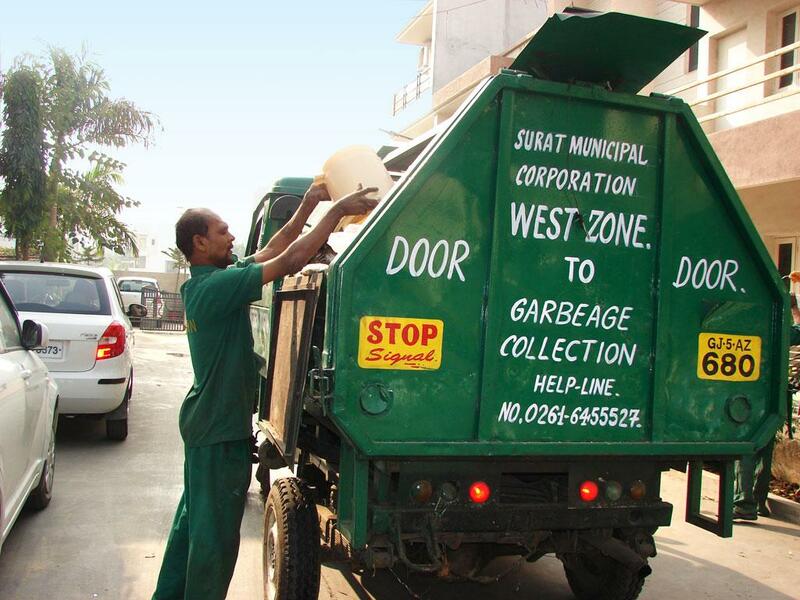 Waste collection efficiency in Surat has improved from 40 per cent in 1995 to 97 per cent today, while the house-to-house collection coverage has improved to 92 per cent. Around 1,570 metric tonnes (MT) of waste is collected in the city every day. SMC has also introduced an Anudan Scheme under which it pays residential societies to collect their waste and clean their premises. “Six hundred societies are part of this scheme and a minimum of Rs 1,500 is paid to every society every month,” says Pathan. SMC generates its revenue for waste man-agement from lease rent and user charges. Citizens pay Rs 600 per annum as user charges for waste management. SMC charges commercial establishments on the basis of the area occupied by them. Surat also collects fines of up to Rs 1 crore every year from citizens, shopkeepers and residential localities for violations such as littering and not keeping their premises clean. “Annually, we spend around Rs 42 crore in collection, transportation and disposal of municipal solid waste,” says Pathan. While SMC has mastered door-to-door collection, it has failed in treatment, recycling and scientific disposal of waste. As a result, one of the two landfill sites has already completed its lifetime and the other one would be full in another year. In October 2014, the Gujarat State Pollution Control Board (GSPCB) issued a notice to SMC, reprimanding it for not filing its annual report on time, not managing landfills scientifically, and not furnishing its online statements. “A case is going on in the National Green Tribunal on the irregularities in waste management by SMC,” says G V Patel, regional officer, GSPCB, Surat. SMC has invited tenders for treatment of organic waste. It also has plans to segregate waste into organic and inorganic waste streams. A waste-to-energy plant is on the cards as well. “The plant would generate 13 MW of electricity,” says Pathan. Surat is also exploring the possibility of converting plastics into fuel—a first-of-its-kind of treatment and reuse in the country. 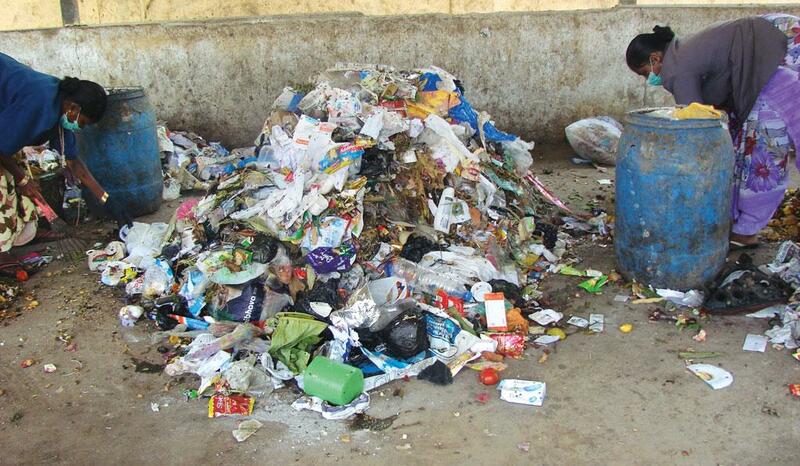 Suryapet, a town 150 km west of Hyderabad, is bin-free. In 2004, it was awarded by the UN-HABITAT for its “good practice” of waste management. The Suryapet municipality, now in the newly formed Telangana state, even got an ISO 14001:2004 certification for establishing environment-friendly systems. The municipality claims to be the first zero waste town of the country. What’s interesting is that the municipality accomplished such a status without incurring any debts. S A Khadar, the then municipal commissioner, says, “It is only the lethargy of municipalities across the country that the waste gets wasted, otherwise it’s a natural resource.” Khadar formulated what came to be known as the Waste Anthem of the two states of Andhra Pradesh and Telangana. This anthem is sung in schools, broadcast on loud-speakers attached to tractor trolleys that move from door to door every morning to collect waste, and is even used as the caller tune on all municipal officials’ mobile phones. The municipality with a population of 0.1 million and an area of 24 sq km is one of the cleanest in the country. When CSE researchers visited Suryapet in 2014, there was no sign of garbage anywhere. 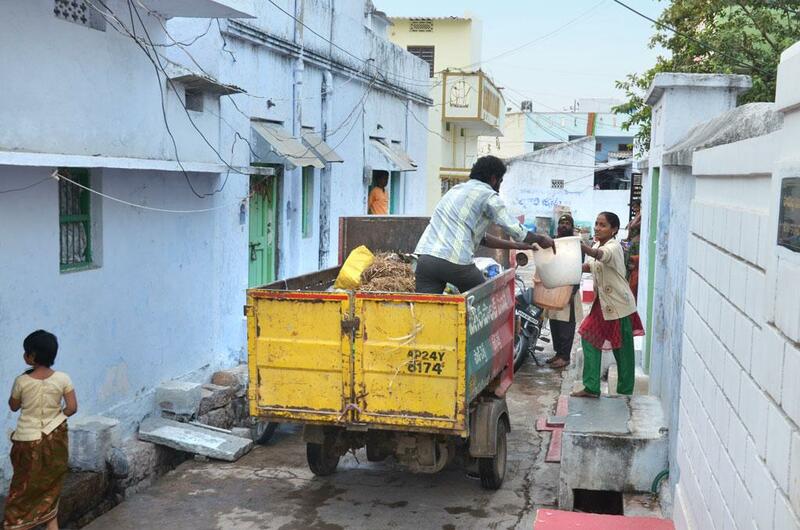 The slums that house 62 per cent of Suryapet’s population are cleaner than many posh areas of Delhi. Under Khadar, municipality functionaries organ-ised regular meetings with ward-councilors and listened to their grievances. Khadar followed a similar attitude for his office staff. Earlier, almost 80 per cent of the municipal staff used to face extensive delays and other difficulties with their leave applications or reimbursements, but these processes were eased to ensure efficiency at work. Even today, over 10 years after these practices were put in place, Suryapet municipal council workers get to the streets to clean the entire town as early as 5:00 am. The sanitation work force includes 70 permanent municipality employees and 223 contractual labourers who go door to door every morning (roughly 72 households per worker). “If any of the sweepers reports at 5:11 am, we count him/her on leave,” says Salman, public health supervisor with the Suryapet municipal council. The cleaning starts by 5:15-5:30 am and goes on till 10 am. By 10 am, when most of the town is out to work, the waste has already been picked up by tractor trolleys and they are on way to the 3 ha waste management site at Jamuna Nagar area of Talakampaad village, some 7 km outside the municipality. Along with street sweeping, the workers are also required to clean the drains. Meanwhile, public health supervisors roam around the town to ensure disciplined work by the sweepers and also redress residents’ problems regarding waste management. The entire workforce breaks for lunch between 10 am and 2 pm. It reunites from 2.00 pm to 5.00 pm for another round of waste collection from areas where the collection is difficult during early hours of the day, like the fish market or the flower market. But despite an efficient collection system, the segregation of waste is negligible. The town has 37 wards, including 48 slums, from which a total of 67 MT of waste is collected every day. About 98 per cent of the collected waste finds a place in the unscientific dumping ground at Talakampaad village; only 2 per cent is processed. What direction should India's waste management take? What does the future hold in store? To minimise use, impose a landfill tax, build sanitary landfills for disposing of residual waste so that there is less pollution. Ensuring a zero-landfill future has to be the aim of a reinvented waste management system. The Solid Waste Management Rules, 2016, accept that landfills should only be used for residual waste—“non-usable, non-recyclable, non-biodegradable, non-combustible and non-reactive waste”. They go on to state that “every effort will be made to recycle or reuse the rejects to achieve the desired objective of zero waste to landfill.” This is an important departure from previous policies emphasising the need for sanitary landfills. The question is: how will this policy be enforced? Currently, all contracts for waste management awarded by city governments to private concessionaires have a perverse incentive to bring larger quantities of waste to the dumpsite. Also, municipalities find that collection, transport and dumping waste is easier than processing it for reuse. To change this, a landfill tax is needed—the contracts need to be redesigned so that instead of the municipality paying for the waste that is brought to the landfill, the contractor should be made to pay a “tipping fee” for the waste. In this way, instead of being paid to bring waste to the landfill, the contractor or city municipality would have to pay a tipping fee to dispose of the waste. Moreover, to protect against groundwater contamination, impermeable lining at the base and sidewalls of the landfill site needs to be laid and the entire leachate needs to be carefully collected and treated before letting it into the environment. Also, it is equally important to lay the final cover over the landfill because once the landfill is filled to capacity, it needs to be closed with synthetic membranes, clay and topsoil in a way that no more waste enters that system and the landfill becomes stable. This must happen at source, only then will there be integrity in the waste stream. It is the responsibility of urban local bodies to ensure compliance with segregation of waste at source, as per the Solid Waste Management Rules, 2016. It must be made mandatory for citizens to perform segregation at source. Door-to-door collection and transport must ensure that this segregated waste is not mixed. 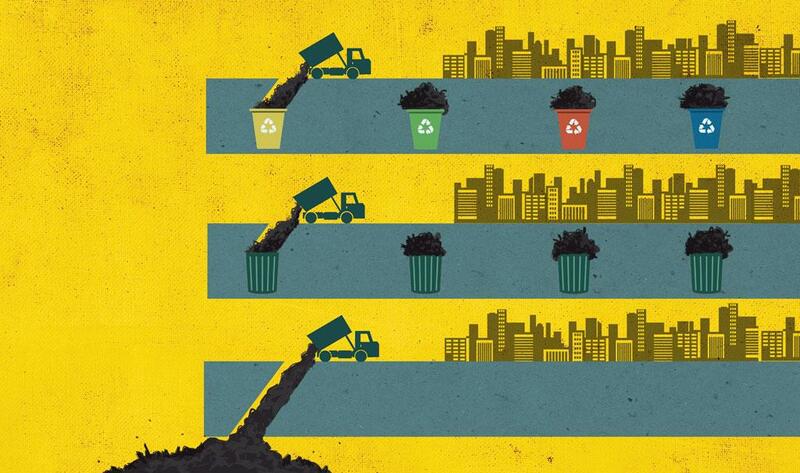 Even when the waste is to be incinerated to generate energy, segregation is the key. But ensuring segregation at source requires tough compliance systems. It is also clear that municipalities will need to put into place systems that will transport segregated waste and then ensure processing is done. In our survey, the only city that has truly adopted segregation is Panaji. Our municipal bye-laws, the Municipal Solid Waste Rules, 2000, and Solid Waste Management Rules, 2016, stress the need for segregation but do not suggest ways to incentivise this. For instance, in Sweden, to enforce segregation, houses pay less user fee for segregated waste and end up paying a higher amount for unsegregated waste. To minimise generation and to ensure segregation, impose a user fee and penalties for non-compliance and littering. Waste management costs a lot. But, currently, municipalities hardly charge for this service. The assumption is that waste management is included in property tax. But as property tax is rarely computed for this service and in most cities rarely charged, the real cost of waste management is never accounted for. This is why municipalities struggle to pay for this service. Matters are made worse because municipal accounts are not properly maintained—most urban local bodies do not even maintain annual accounts. The 2016 Handbook on Urban Statistics, published by the Union Ministry of Urban Development, finds that in 2006–08 the average per capita municipal income in the country was roughly Rs 2,500; the per capita municipal expenditure was also the same, more or less. In most states, the per capita income and expenditure was less than Rs 1,000. The only way out of this is to ensure that household pays directly to agencies that are responsible for transportation and processing. Only then will the full costs of the service be accounted for. The Solid Waste Management Rules, 2016, prescribe that urban local bodies should impose user fees for waste generation and also levy spot fines on people who litter. But the operative problem is that all this needs to be done through the revision of bye-laws of the municipal body. In most cases, the revisions do not happen. To further strengthen the Swachh Bharat Abhiyan, the Ministry of Environment, Forest and Climate Change has proposed to make littering, throwing waste in the open, dumping electronic waste, defacement of public places and use of banned plastic bags “minor offences” with fines on the spot. Informal waste recycling sector is the real game-changer for India’s waste story. It is said (the data is weak, however) that recycling of dry waste provides employment to about 1–2 per cent of a city’s population, often the poorest women and children. In large cities, there are two–three tiers of waste buyers, all very well organised and specialising in specific wastes. What is not recognised is that this trade—which happens in the backyards of our slums and is shoved aside by policy, is the only thing saving cities from completely drowning in waste. It is also this trade which ensures that less waste reaches landfills. There is a great need for official su port to this unappreciated activity that saves 10–15 per cent in transportation costs daily to the city, adding up to millions of rupees a year. New ventures are also emerging to remove the stigma attached to the garbage-sorting business. In the capital, ventures like Raddi Express, Raddi Bazaar and in Mumbai Raddiwala have all made paper collection an easy and profitable business. 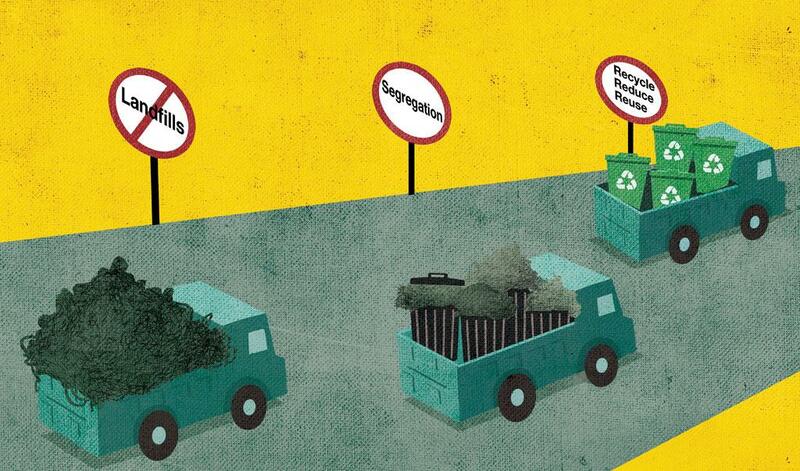 Waste management contracts must be structured to ensure segregation happens at all costs. Most contracts between the concessionaire and the municipal authority focus on segregation at source, but only on paper. For every tonne of waste managed by the concessionaire, the municipality gives a “tipping fee” (between Rs 500-800/MT), and it states that it will pay more for unsegregated waste. The reinvented contracts must pay for segregated waste disposal and processing. Ideally, the contracts should not pay for quantum of waste collected, but for the quantum of waste processed and recycled. Any waste that is taken to the landfill must be charged through the landfill tax. It is clear that the issue is not whether waste management should be decentralised or centralised. The question is how waste will be processed and reused. It is clear that decentralised solutions will cut costs of transport and make households and institutions part of the solution. The National Green Tribunal’s (NGT) view that decentralised plants are not environmentally sustainable is incomprehensible. However, NGT is right in stating that clear availability of land will be at a premium. This, however, does not mean that the “cluster approach” will make this problem go away. As more waste gets generated, more land will be required in this scheme of things. Many clusters will be required. It is also clear that the cost of transport is a key component of waste management and the farther the site, the more will be the transportation charge. The Central Pollution Control Board (CPCB) knows that management of such common facilities is difficult. This is clearly the experience in the country as accountability is divided between multiple agencies and in this case, multiple city governments. They will all have to adhere to common minimum standards of waste composition and ensure terms of contract are fulfilled. In its action plan, CPCB should have also suggested a suitable management framework for such common waste facilities so that these do not become new urban nightmares. Not-In-My-Backyard (NIMBY) is a game-changer in waste management. The global history of waste management is testimony to this. In the early 1980s, garbage ships travelling from rich cities of the US and Europe to Africa had become a global scandal. This led the world to agree on the Basel Convention on the Control of Transboundary Movement of Hazardous Waste and their Disposal. The fact was that NIMBY of the global rich had pushed the waste into the backyards of the poor of Africa. But as the poor rose in protest, the rich had to take back their waste and devise ways of management that would not lead to stink in their frontyards. This is how waste management has evolved in the western world; so that they have no option but to reuse, recycle and incinerate, but all in their own backyard. This is why India should be celebrating its own NIMBY. For long, we have used the backyards of our cities, where the poor live, or villages.